On the approach to the bridge there is a button by the side of the highway. Cyclists can hit it to activate two flashing lights. The lights let motorists know that a bike is on the bridge. On Tuesday afternoon, I stopped to push the button. Nothing happened. And as you can see in the video above, nothing happened again when I repeated the maneuver for the sake of videography. I emailed Ron Irish, the go-to guy at City Hall on anything having to do with traffic or streets. He emailed back and reminded me that the lights are ODOT’s responsibility. How long the fix will take probably depends on the cause of the problem, whether it’s just a couple of bulbs that have to be changed, or something more involved. Friday update: Based on the email quoted above, I checked on Friday afternoon (March 22). Nope, the lights had not been fixed. But, lights or no lights, thanks to courteous and careful drivers I once again made it across unscathed. Passing the non-functioning light switch, traffic heads for the Ellsworth Street Bridge on Tuesday afternoon. Several of the overhead street lights are out too on the bridge. …and they need power washed. Is it safe? After riding the awful mile east of Hyak Park (three miles if not turning off on Thornton Lake Dr), anything else seems safe. For pedestrians, I just move over to the roadway and pass them. Or, stop and move my bike out of the way long before we cross over, leaving no doubt in their mind that they are getting the right of way – same as for narrow trails. Of course, I don’t recommend the sidewalk to anyone else (my lawyer is looking over my shoulder;-). Maybe my cockiness about the sidewalk is the same faulty belief held by people who fear flying, but have no trouble driving to the airport, which is much more dangerous (even with the Boeing fiasco). People in High Places say one of the following is true regarding the 737 Maxi disaster. 2. American taxpayers, who complain, whine and gripe about airlines, airline food, and airline safety are the very same taxpayers who have, as a result of Trumpian policy, decided that airplane safety is no longer preeminent. As such, the FAA has farmed-Out a great deal,of the testing procedures to the very manufacturers of the plane in question. Either possibility is distressing. But Number 2 is a bit more so, because it once again shows how big, fat, lazy Americans want and want and want, except they DON’T want to pay. Then, when planes begin falling out of the sky, these same folks should simply shut-up. The same goes for the lighting on the bridge. It was just a lefty taking a wild shot to blame My dear President Trump for a bicycle present light. The 737 is an old plane Boing made it more efficient by utilising larger engines. These larger engines needed to be installed more farward on the wing due to the center of gravity compliance. Moving the engines forward caused the nose to pitch up during high thrust conditions the MCAS system used one angle sensor to determine the position of the nose of the aircraft. To disable the MCAS is a switch for aleron cut out. The pilots who crashed were overwhelmed with fighting the aircraft to flip the switch, added to low hours in that aircraft. One wonders why bicyclists seem to only honor the bikes-on-sidewalks ban whilst navigating cross the bridge. The rest of the community witnesses bicyclists pedaling on the sidewalks hourly, even when there is a “bike lane” provided at great taxpayer expense. Bikes on the bridge, indeed. Here is a suggestion…walk the bike. That’s what we used to do back in the day. And if someone was walking across the bridge, we would give right-a-way to them. 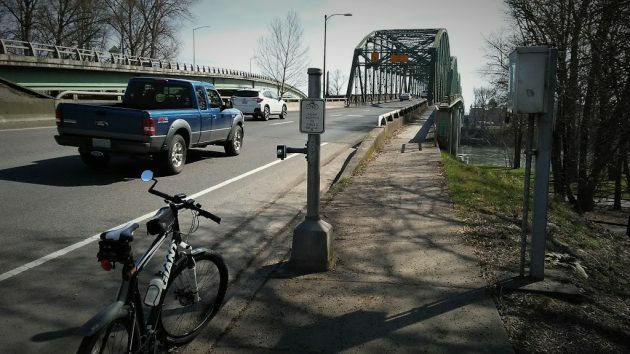 Two problems for bicyclist’s riding over the bridge coming into Albany are your bike pedals are at curb height, so you need to keep a safe distance from the curb. Keeping that safe distance brings you closer to side mirrors of big trucks. You either need to ride at the speed limit or ride on the sidewalk and dismount and yield. Putting your trust on the blinking light helps motorist know I’m ahead and I’m entitled to my share of the road, but when it’s busy it’s better to be safe than sorry. I ride that bridge often. I can usually ride close to the speed limit along with traffic as long as I don’t stop to push that button. I would suggest a different type of switch, like a lever that can be triggered without slowing down. I am not sure what the new lights will look like, but yellow LED’s would be much more visible than the old incandescent faded yellow bulbs. Update from Ron Irish, Wednesday, April 3rd: He believes the lights have been repaired but the relay at the switch post is faulty and it is back in the ODOT court to repair. They know about it, but does not know how long before it is fixed. Here’s another thought; add Sharrows on the bridge consistent with the ones that were added to the streets downtown. For anyone that agrees, Ron suggested submitting that suggestion directly with ODOT on the Ask ODOT page, https://highway.odot.state.or.us/cf/comments/comments.cfm since there is not enough room for a bike lane and the sidewalk is not the best choice as mentioned by others.